Would AT&T buying T-Mobile benefit consumers? Last week, the U.S. Department of Justice filed suit to block AT&T’s proposed $39 billion acquisition of number-four mobile operator T-Mobile, arguing that the combined company would mean less choice and lower quality products and services for wireless users. Now, AT&T has fired back at the Justice Department, arguing the opposite in a filing of its own (PDF). According to AT&T, the acquisition can’t possibly hurt competition — since, in AT&T’s view, T-Mobile isn’t a viable competitor anyway. Moreover, giving AT&T more spectrum would intensify competition in the wireless market. Do AT&T’s arguments hold any water? AT&T’s primary argument that acquiring T-Mobile will benefit consumers stems from combining the company’s two networks —and spectrum licenses — to create a single, broader network. According to AT&T, a combined network would not only cover a greater proportion of the U.S. population, but also would offer better service in urban markets were the company has continually struggled — the San Francisco Bay Area and New York City come immediately to mind. The company minces no words that its interest in T-Mobile is all about spectrum. “This transaction is a response to, and will help mitigate, the spectrum shortage that has occurred as the number of wireless subscribers has grown from just over 100 million to more than 300 million in just the past decade and the use of wireless data services has increased dramatically,” AT&T wrote in its rebuttal to the Justice Department. AT&T posits the combined network will be “more than the sum of its parts” due to increased efficiencies. In practice, “increased efficiencies” will basically boil down to acquiring T-Mobile spectrum licenses in the 1700MHz band — the same frequency band AT&T will be using for its pending LTE-based 4G service — and shutting down T-Mobile’s existing HSPA+ “4G” service. Acquiring T-Mobile’s 1700MHz spectrum licenses could enable AT&T to get close to its stated post-merger promise of bringing 4G LTE service to 95 percent of American consumers, including some in poorly-served rural areas. According to AT&T, acquiring additional spectrum will increase competition in the broader wireless industry by enabling AT&T to free up spectrum (by dropping HSPA+) and expand network capacity, thereby offering “better services” to consumers. AT&T notes Deutsche Telekom doesn’t plan to sink additional investment money into building out T-Mobile’s infrastructure, leaving T-Mobile perpetually “stuck in the middle” between national players like Verizon, Sprint, and AT&T, and smaller players like Leap/Cricket, MetroPCS, and regional providers like U.S. Cellular. 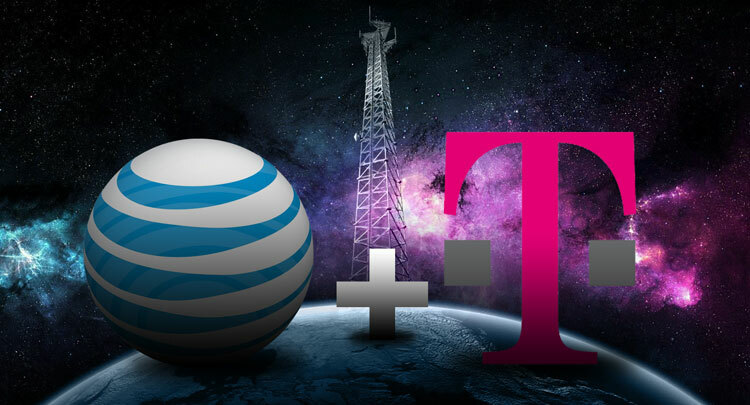 AT&T’s interest in T-Mobile is all about spectrum, capacity, and expanding the company’s ability to bring LTE-based 4G services to consumers. However, despite AT&T’s characterization of T-Mobile as being locked out of the 4G game, AT&T is talking about just the LTE 4G game. For the last year T-Mobile has been marketing HSPA+ data services as “4G” — and, if one accepts that claim, T-Mobile is in the ironic position of having the largest 4G coverage footprint of any carrier in the U.S. market. To almost anyone who isn’t AT&T, that’s a distinct competitive advantage. T-Mobile’s current HSPA+ services basically provide the real-world downstream bandwidth comparable to Sprint/Clearwire’s “true” 4G WiMax services, and in real world testing they typically beat WiMax for uploads. Furthermore, T-Mobile has recently begun expanding HSPA+ capacity well beyond bandwidths offered by WiMax — the downside is that virtually no devices can yet leverage it. Nonetheless, AT&T acquiring T-Mobile would involve shutting down the largest operating “4G” service currently available to consumers. It’s hard to see how that helps T-Mobile customers. Even more ironic, AT&T is currently pushing its own HSPA+ services as 4G (today’s announcement of the Acer Iconia Tab A501 is an example), even though they offer about half the real-world bandwidth of T-Mobile’s HSPA+ services. From one side of its mouth, AT&T claims T-Mobile’s existing HSPA+ 4G service isn’t competitive, while, from the other side of its mouth, the company is trying to entice consumers with its own lower-bandwidth HSPA+ services, also billed as “4G.” One could easily argue T-Mobile is more than competitive: It’s beaten AT&T at what even AT&T calls 4G. Nonetheless, T-Mobile does lack a clear path towards LTE 4G services, and in the long term that will be a significant hurdle for the company. Device manufacturers are already jumping on the LTE bandwagon, preparing tablets, smartphones, modems, and other devices that support LTE services. No matter what kind of capabilities T-Mobile can leverage out of its HSPA+ network, few device makers will be interested in creating one-off devices just for T-Mobile. Going forward, an LTE-free T-Mobile will be able to offer fewer mobile broadband products than LTE-based competitors. If the AT&T/T-Mobile merger is blocked, T-Mobile has limited options to move towards LTE. Perhaps the most likely would be a spectrum-sharing arrangement with another carrier—likely, AT&T, but perhaps Sprint. Such a deal would potentially see T-Mobile selling access to its 1700MHz spectrum in return for subsidized or otherwise guaranteed access to that LTE network for its customers. One major downside of the deal would be the same as the AT&T/T-Mobile merger: T-Mobile’s HSPA+ services would have to be shut down to make way for LTE services in the same spectrum, which means T-Mobile’s most valuable existing customers would need new handsets and new services… and might well decide they need a new carrier. T-Mobile’s other LTE options see the company going eyeball-to-eyeball with Sprint… on Sprint’s home turf. One possibility would be to purchase wholesale LTE services from Clearwire, once (and if) Clearwire adds significant LTE capability to its existing WiMax network. However, Sprint is Clearwire’s major wholesale customer and largest investor, and such a deal would put T-Mobile’s 4G fate in the hands of a competitor. Another option would be to ink a deal with LightSquared for LTE services—however, such services may be in short supply, since LightSquared inked a $9 billion deal with Sprint that gives Sprint the option to buy as much as 50 percent of LightSquared’s LTE capacity. Again, Sprint would have an uncomfortable chokehold on T-Mobile’s 4G capabilities. To avoid putting all its eggs in the same basket, T-Mobile could potentially pursue deals with both Clearwire and LightSquared — but those two baskets would be very close together. AT&T characterizes T-Mobile as the only major carrier to have lost subscribers as the mobile market has exploded. That’s not strictly true: Until the last couple of quarters, Sprint had also been hemorrhaging alarming numbers of subscribers. Despite recent gains in prepaid users and postpaid subscribers, Sprint is continuing to lose money in a market experiencing extraordinary growth, posting an $847 million loss for the second quarter of 2011. Leap Wireless lost subscribers last quarter, and U.S. Cellular has lost subscribers for five straight quarters. It would be just as accurate — and just as hyperbolic — to say that all major carriers without the iPhone have had trouble adding subscribers. AT&T argues competition from Verizon Wireless and Sprint — as well as “upstarts” such as MetroPCS and regional providers like Cellular South — means AT&T will have neither the incentive nor the plain capability to raise prices or slow innovation; if it tried, it would get spanked by its “aggressive rivals.” However, history is not really on AT&T’s side. If the merger is allowed to proceed, the combined AT&T and T-Mobile will be the largest mobile provider in the United States, accounting for about 43 percent of the mobile market. Verizon Wireless would become the second-largest mobile operator, with about a 36 percent share, and Sprint would remain third with about an 11 percent share. Between them, a merged AT&T and Verizon Wireless would control more than 80 percent of the U.S. mobile market, and each firm would be more than three times larger than its nearest competitor. Those conditions make the market ripe for collusion. Neither AT&T nor Verizon Wireless (or Sprint or T-Mobile, for that matter) actually work to maximize value to consumers: They work to maximize value to their shareholders. When two companies control such a large share of a market, they can exert significant pressures on suppliers that raise costs, reduce availability of resources, or form significant barriers to competition. To maximize value to shareholders, Verizon Wireless and a combined AT&T/T-Mobile could find their best path to shareholder value is to maintain prices — and even raise them — since their “aggressive” but much smaller rivals would not be able reach significant numbers of consumers at lower prices. Industry watchers generally agree that the Department of Justice’s antitrust suit to block the AT&T/T-Mobile merger puts the whole transaction on shaky ground. Nonetheless, AT&T is continuing to fight for the deal, and would vastly prefer the matter not go to trial. The company’s preferred route would be to reach a settlement with the Justice Department that will let the merger go through with some amended terms and conditions — perhaps AT&T will shed some spectrum licenses to rivals, or agree to more-rigorous-than-usual oversight for a fixed period if the merger is allowed to proceed. In any case, the pressure is on AT&T: if the deal doesn’t go through, it has to pay T-Mobile billions in compensation, and would still lack network capacity and licenses to roll out the nationwide LTE service it wants.